East of England Plan 10th March Update:There are now only 6 more days before the closing date for submissions on this plan. The Rural Preservation Society and Theydon Bois Parish Council are both finalising their responses and you should have by now recieved a notice through your letter box about making a response to the plan. We hope that as many of you as possible will make the effort to reply as this plan will certainly affect us all well into the future. Numbers will count! The distributed Notice and further information is available here to help you make a reply. You can also download our own general reply form in Word that is more user friendly than the EERA one here. See below also for the earlier news item on the East of England Plan. Open Gardens Day: After years of organising Open Gardens Day Joy Wainwright is taking a well earned rest and this year the task has fallen to Carole James. This year will be the 25th year for Open Gardens Day in our village and Carol is sure that the village gardeners will be working hard as usual to put on magnificient displays. If you would like to open your garden on the day or want further information contact Carol. Tel: 01992 812250. Note the date in your diaries: SUNDAY 26th JUNE. Youth Initiatives: In the past the Parish Council had been criticised for not doing enough to provide for the 11-16 year old age group. A youth audit was carried out but the response had been disappointing and some of the facilities requested it would not be feasible for the Parish Council to provide. What has now been proposed is that a hard play area would be the best compromise and would be for general community use as well as for the teenagers. Cllr Padfield displayed a picture of the proposed scheme to those present at the last open Parish Council Meeting. . 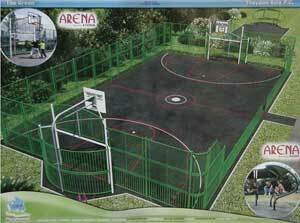 The Play Area would be 20m x 12m with 3m high fencing. Also proposed is a youth shelter and small 10m x 6m area for skateboarding adjacent to the main pitch, together with sympathetic landscaping. A number of sites had been discussed and discounted as unsuitable prior to the Parish Council Meeting . The Youth Centre had been discussed at length and it was felt that with the pending pubic enquiry the dispute over the site may be lengthy, and in any event the outcome was uncertain. Even if the Youth Club were to be retained for community use it could be expensive to run. It was therefore felt that the only remaining option was on the site of the disused public conveniences on the Green. Cllr Padfield emphasised at the meeting that it would be necessary for the village as a whole to support the idea in order for it to proceed and wider consultation with the community would need to take place. Approval from the Corporation of London would also be necessary to utilise the site. Cllr Gooch raised concerns that such a facility would change the character of the Green and questioned the need for such a high cost provision, given the number of teenagers being catered for. He also stated that should a grant be received from EFDC for this facility now and the Youth Club became available to the Parish Council at a later date, it would be at a disadvantage having already received funding for a large youth project in the Village. Cllrs Gooch, Jones and Oliver felt that to apply for planning permission at this stage was premature and greater consultation should take place before a resolution was passed. Cllr Hannibal stated that with the decision on the Youth Centre likely to be a long way off, the absence of any other suitable proposals, and the limited period to receive funding from EFDC it would be appropriate to apply for planning permission now and would provide the opportunity to test public opinion. Even if planning permission was obtained, it would not necessarily mean that the project would go ahead. Cllr Hammond stated that there had been a number of objections when the Playground at Theydon was created and after a settling in period it had proved to be a great success. Cllr Oliver was concerned that the site may attract youngsters from outside the Village which could cause conflict. 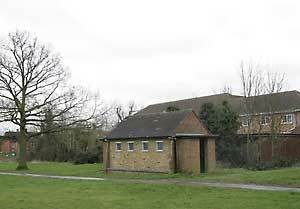 Cllr Glozier reported that a similar facility at Chigwell Row was well used and considered a village asset by Chigwell Parish Council, despite initial objections. The following resolution was put to the Parish Council: The Parish Council will apply to EFDC for planning permission for a hard play area and associated facilities on the site of the Public conveniences on the Green. The application will be made on the current draft plan, subject to any amendments made by the Corporation of London. At the end of the meeting when members of the public were allowed to speak several village residents near to the Green expressed their anger at the possibility of having a hard play area built on the site of the current toilet block. Concern was also expressed regarding the nuisance it might cause to the residents of Elm Court. Residents who live in Green View nearest the public conveniences complained that gangs were already 'mooning' at them and relieving themselves at the back of the toilets. Cllr Eaton stated that the police would be contacted regarding this particular matter. Further concerns regarding the proposed hard play area included security, policing, vandalism and the possibility of drawing in youngsters from outside the Village. A number of those present felt that the site was inappropriate for this type of facility. Councilors said that concerns were noted and consultation would continue. East of England Plan 19th Jan. Update:We have now added download pdf copies of all the main documents connected with the plan on our site. See article below. 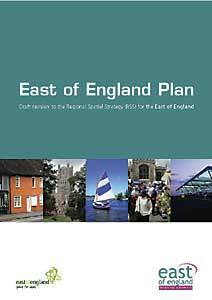 East of England Plan (pdf 2.7mb) Approx. 12 minutes on 56K dial-up. Approx. 1 minute on 56K dial-up. Report of the Sustainability Appraisal (pdf 1.3Mb) Approx 7 minutes on 56K dial-up. To download these documents to yourcomputer we suggest you right click the link above and select Save As. East of England Plan: EERA's East of England Plan was published in the middle of December and is now in the public consultation phase. Comments on the plan can only be made up to the closing date for submissions which is 5pm on the 16th March 2005. This is a very important document that proposes the building of 478,000 in the East of England, 123,400 of these will be in Essex and 11,000 in the Epping Forest District. Theydon Bois & District Rural Preservation Society together with other bodies and M.P. Eleanor Laing have already presented a Petition about the environmental damage this number of homes would cause to the Forest and surrounding area and they are working on a response to the plan as a whole. They have posted their first comments on an EERA Up Date Page together with a number of useful links. Our Parish Council is also considering their response but is is important that as many people as possible should make a submission before the closing date. At first view the good news for Theydon Bois is that large amounts of the proposed housing to be located to the south of Harlow is now to be located to the North, but 2,700 are still to be built to the South & West of Harlow and as there is now no provision for infrastructure here and few roads in this Green Belt area at present (as well as a strong and well funded protest group) there are fears that this block of housing could be relocated to Debden (the Harlow Options Study, one of the feeder documents to the plan suggested possible development here). If this plan is accepted in its present form, even without these houses in our district, we will still be strongly effected by traffic, pollution ect. so it is very important to make your views known. One of the problems about the consultation is the size of the East of England Plan (over 300 pages) and the fact that it is only available to individual applications (a body can't order a number of copies, the Preservation Society tried) this makes it much more more difficult for individual members of the public to obtain a copy and respond even though they are requested to do so. You can phone or write for your own free copy and they will be available in Public Libraries and hopefully the Parish Office at the Village Hall may soon have them to view. You can also view the plan on the EERA web site or we have made an Adobe pdf available for download here. The file size is 2.7mb and download time should be about 12 minutes on a 56k dial up and about 1 minute broadband. We suggest you right click the link above and select Save As. EERA would prefer you to respond by registering and filling in the form on their site if possible, but will also accept postal responses and the form to do that is available as a Word document here. Please make sure you have your say. Latest January Neighbourhood Watch/Beat Mobile Newsletters: are now on site Click Here to keep informed about the latest Watch issues. Parish Council Minutes: The November Parish Council Meeting Minutes are now available. Click here. Village News December 2004 Issue 48: The full colour pdf of the latest issue is now available to download Click here. 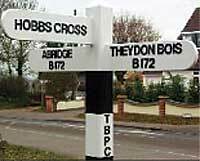 Theydon Bois Village Youth Audit: As you may remember from a previous news item on this Web Site, an audit was circulated for completion by the youth of the village. The aim of the audit was to try and determine what the youth of the village were currently doing in their free time and what other facilities they would like to be available. The idea for the audit arose from the work of the Youth Initiatives Committee. This committee was set up by the Parish Council following the County Council's closure of the Youth Centre and the subsequent lack of provision of youth services in the Village (with the exception of the mobile youth service bus which is supposed to visit Theydon Bois one evening a week, during term time). It was agreed that we couldn't really make any plans without knowing what it was the youth wanted and so the idea of the audit was born. It was designed with some help from the District Council and aimed at the target group of 11 to 17 year olds. We have to say that the response to the Audit was somewhat disappointing. There were only 52 responses from the entire village. We would like to think this was due to the fact that most of the youth in the village are satisfied with the facilities available and have full and active social lives. However we can not be absolutely sure. Of the 52 replies 32 were male and 20 were female. 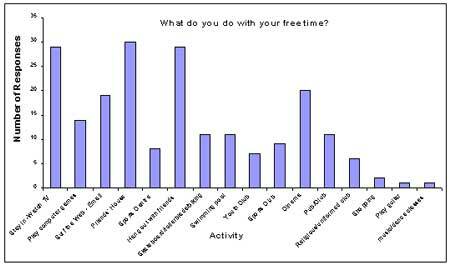 We asked for the top five spare time activities from each respondent and, as you can see below, the three categories that scored highly were: staying in and watching TV, going to a friend's house and hanging out with friends. New Fingerpost Sign at the Junction of Coopersale Lane/Abridge Road: We were very pleased to receive a donation from a local resident, Miss Hudson of Coopersale Lane, to cover the costs of re-erecting the wooden fingerpost sign now in place at the junction of the Abridge Road and Coopersale Lane. This was made and installed by Mathew Cable (ex V. Cable & Sons Builders of Bell Common) who has the "Grandfather rights" from the Highways Dept at EFDC to erect such signs, although it then becomes the responsibility of the Parish to maintain that item. We believe this enhances the local environment and supports the fact that Theydon Bois still remains a Village, despite it's proximity to London, the M25 and the Central Line. Wooden fingerpost signs still remain an effective way for signposting on a B road, in this case replacing a dilapidated metal sign not in keeping with the countryside.